Figure 1: Girim transformed, not valuing the Corona sunflower. Within movies, there are cues to help the audience figure out who are the good guys and who are the bad guys. 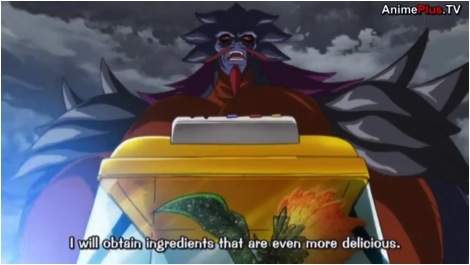 The film Gekijouban Toriko: Bishokushin no Special Menu uses food as a means of showing evil and good. The film is based on a television series called Toriko about Toriko who is a gourmet food hunter. He takes expeditions to find and eat the world’s best ingredients. He usually travels with his friend Komatsu and they work together to create a delicious full-course menu. Toriko works for the International Gourmet Organization (IGO). In the movie and the television series they have secured research areas called Biotopes. As Toriko and his friends enter a Biotope known as Acacia’s kitchen, they are surprised to see a vast amount of rare ingredients and creatures, including the Corona sunflower. Ayame is a woman who lives in this Biotope and is in charge of watching over it. This particular biotope was created for researching ruins preserved within. In other words, IGO works to collect and protect rare ingredients and creatures. The way IGO handles food already indicates that Toriko is a good person. In their first encounter, Toriko tries to stop Girim before he can destroy any rare ingredients. After Girim unleashes the rare creature the wolf fire dragon, or Endros, Toriko says his catch phrase, “With thanks to all the ingredients in the world, let’s eat,” before he and his friends defeat Endros. Toriko was planning on eating Endros together with all of his friends. Later on, Toriko says that eating the nectar of the Corona sunflower Ayame worked hard to raise and Komatsu risked his life to protect filled his stomach, but corrects himself saying it satisfied his heart. Also, despite the fact that Toriko spent most of the movie fighting against Girim, Toriko yells for someone to hurry and get him something to eat after seeing he was still alive. All of the above examples show how Toriko really treasures his friends and the food that could be eaten with them. In contrast to Toriko, Girim’s interactions with food define him as the bad guy. His first interaction with food in the film is when he destroys all of the Corona sunflowers. Girim waits until Toriko and the others use their last strength to beat Endros and then eats it all in one big gulp. Girim and Ayame joined forces in the past, working to create a full course menu of their own. The Corona sunflower was the first ingredient they decided to add to it and the Corona sunflower was going to be their hors d’oeuvre. He forgot about wanting to eat delicious food with Ayame and now only wants to make a full course menu that will be the best in the world. The picture shows Girim after he partially became what he ate and that the Corona Sunflower is not good enough for him anymore. Ayame feeds Girim the remainder of the Corona sunflower when he is near death saving his life. After this point, his actions involving food are completely different becoming gentler. He says the Corona sunflower is the most delicious thing he has eaten in a while, because the emotion Ayame put into it while growing them reached his heart. When everyone is feasting later, his portion size is dramatically smaller and he takes smaller and multiple bites. Now that he treats food in a better way, he is not portrayed as bad anymore. At the end of the movie, he is seen with Ayame as they watch overly a new field of Corona Sunflowers. Gekijouban Toriko Bishokushin no Special Menu. Akifumi Zako.